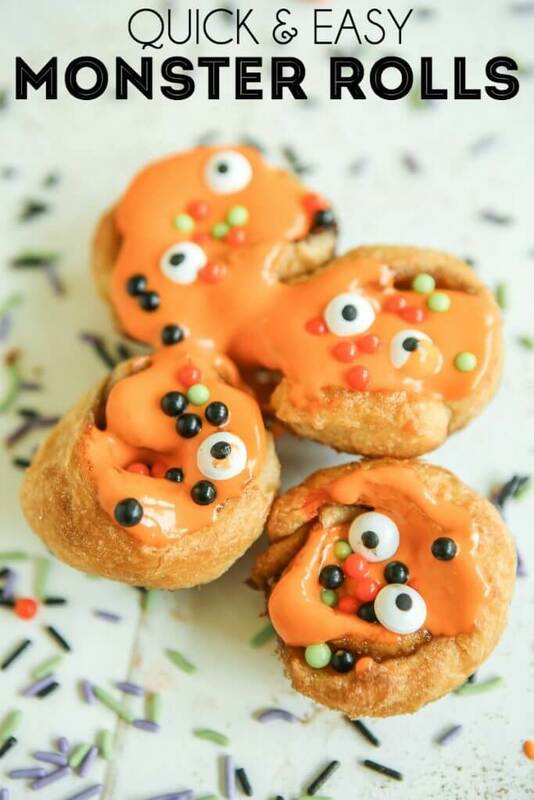 These mini Halloween cinnamon rolls are a yummy and not so scary Halloween party food because they’re super easy and quick to make, and people will love the surprise of eyes and Halloween treats inside. One of my favorite things about the fall is Halloween parties and all of the cute Halloween party food that people come up with. And this month for our creative foodies challenge, we’re all doing just that – sharing some awesome Halloween party food ideas. 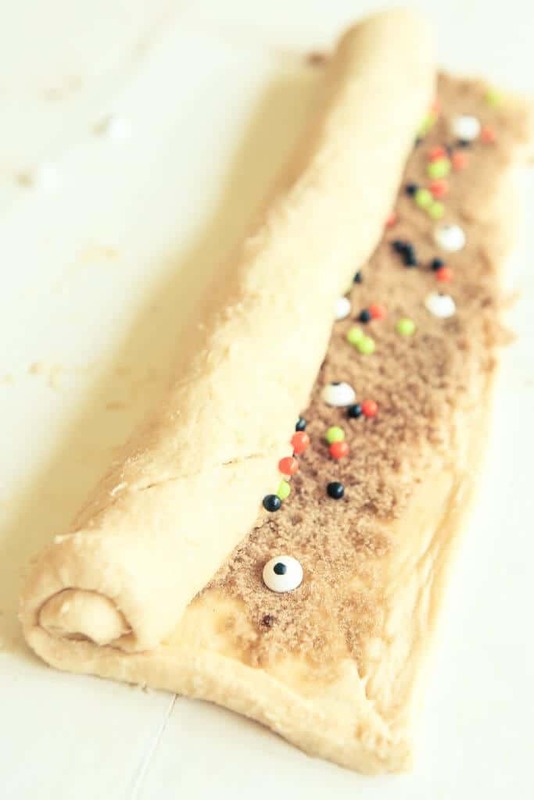 Make sure to read all the way to the end for some incredible Halloween party food ideas. For me, monster treats are the biggest hit. 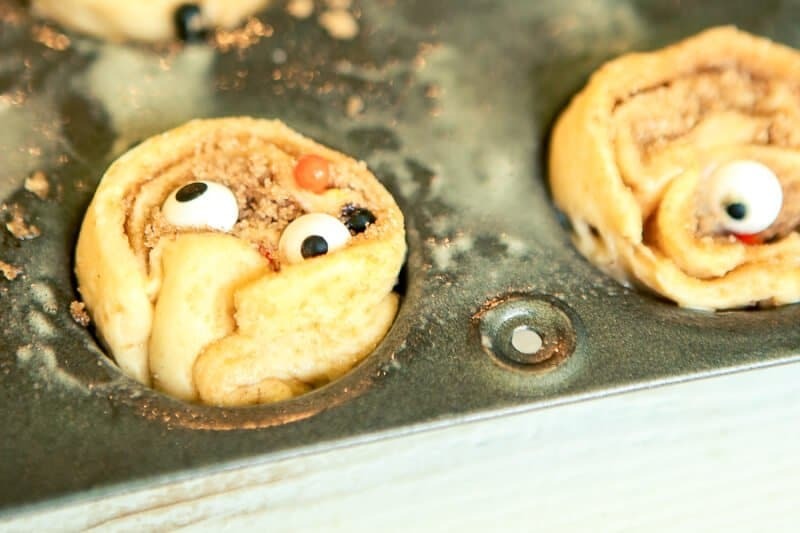 I always have a stock of the candy eyes just sitting around begging to be used, so I whipped up these cute mini Halloween cinnamon rolls, topped them with some Halloween frosting, and added some eyes to make mini monster rolls. 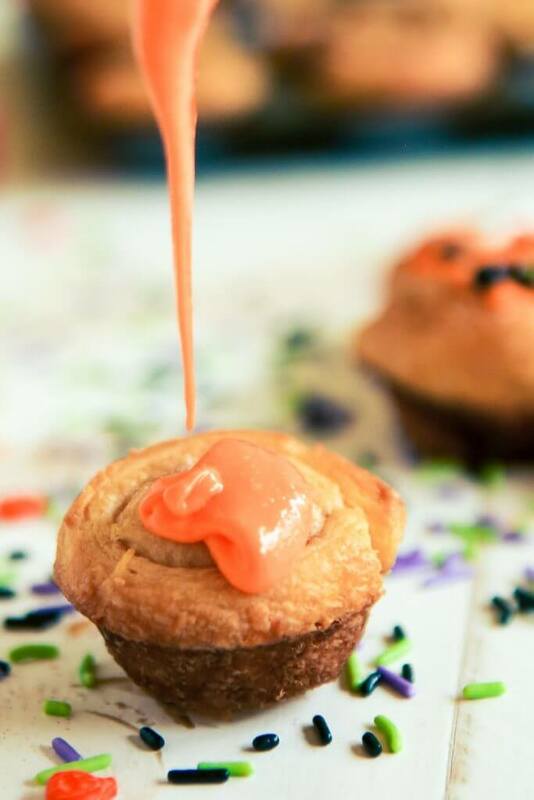 Need more great Halloween party food ideas? Check out these 11 other Halloween party foods that are sure to make your friends and family scream in delight. 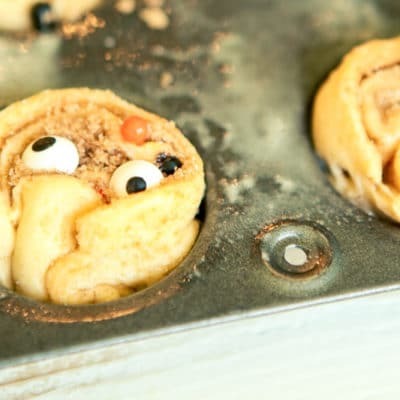 These monster inspired mini cinnamon rolls are the perfect monster food for Halloween! Start with Pillsbury crescents and turn them into something that both kids and adults will love. They’re great for a party, for Halloween breakfast, or when you want something homemade but don’t have time to make cinnamon rolls from scratch. Preheat oven to 375 degrees and spray a mini muffin tin with non-stick baking spray. Open crescent rolls and place flat on a surface. Pinch the seams of the rolls together to form one long rectangle sheet. Roll out using a rolling pin to create a nice even rectangle surface. Top crescent roll dough with melted butter, then brown sugar, and finally sprinkle with cinnamon and spread around evenly. 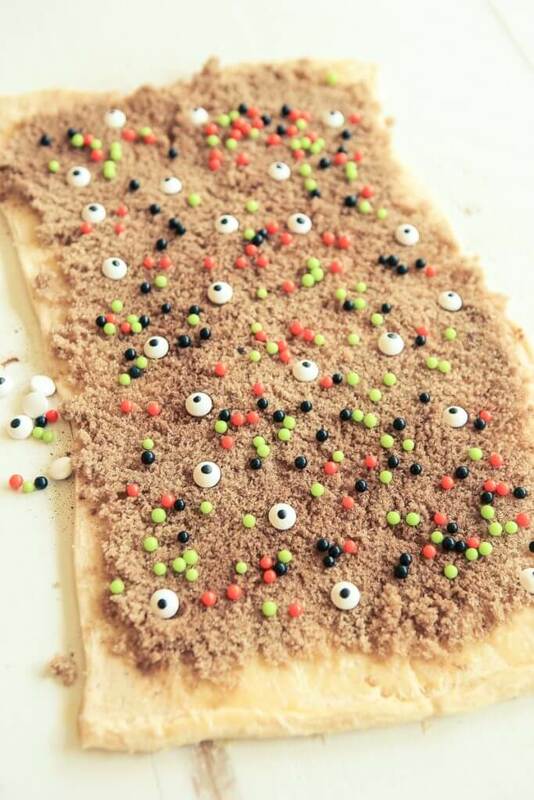 Sprinkle candy eyes and Halloween colored sprinkles on top of the cinnamon sugar mixture. Roll up tightly long wise from one side to the other making sure to keep the roll as tight as possible. Using a sharp knife or dental floss, cut small pieces of the crescent roll dough and place into the prepared mini muffin tin. Cook in oven for 7-9 minutes or until crescent dough seems cooked. Remove from heat and remove from pan to cool while you make the frosting. Top with orange frosting, eyes, and Halloween sprinkles. Heat cream cheese in microwave for 30 seconds. Beat heated cream cheese, sugar, and milk together until completely smooth. Add food coloring and mix in thoroughly.